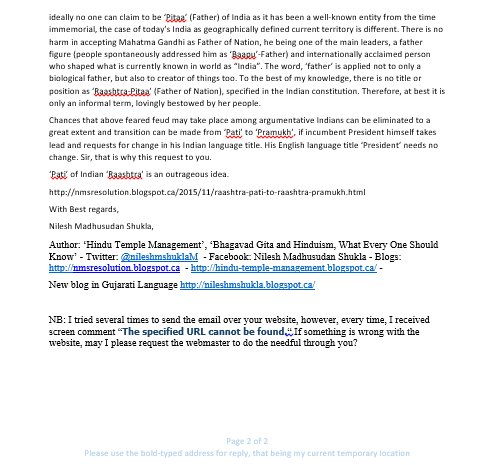 Should we not revise the title- From Raashtra-Pati to Raashtra-Pramukh and correct error ? Since ancient times people living here have considered themselves as Children of Maa Bharat. That relationship is part of our continuing ethos. President of a country is ‘Head of the State’. Its nearest equivalent word in the Indian languages is ‘Raashtra-Pramukh’ (translated, ‘Country’s foremost face/leader’). Among many innocent translation mistakes India has done in her naivety, one is ‘Raashtra-Pati’ for “President”. After Independence, gradually freer minds are now able to look more independently at Indian ethos. ‘Pati’ with ‘Raashtra’ is not a good fit. In Indian languages ‘Raashtra-Pati’ conveys the sense that the incumbent is Mother India’s ‘husband’, ‘owner’ or ‘boss’. 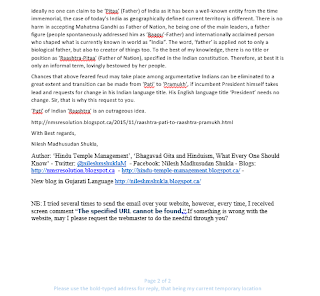 That he or she is not and Indian ethos do not even imagine so in its wildest imagination. Therefore, it is time we correct this error and make changes as “Raashtra-Pramukh”, ‘Oop-Raashtra-Pramukh’, ‘Raashtra-Pramukh-Bhavan’ etc and so on as applicable. 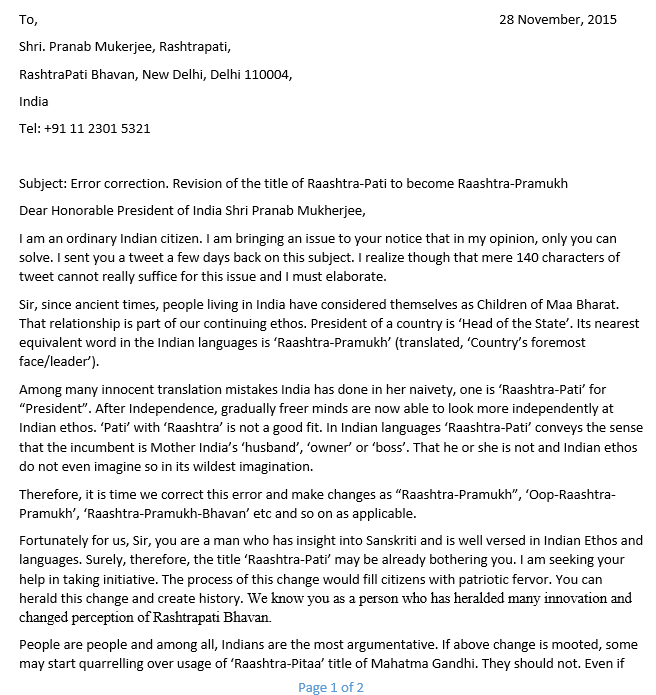 Fortunately for us, the current incumbent Pranab Mukherjee is a man who has insight into Sanskriti and is well versed in Indian Ethos and languages. Surely, therefore, the title ‘Raashtra-Pati’ may be already bothering him. I am seeking his help in taking initiative. The process of this change would fill citizens with patriotic fervor. He can herald this change and create history. We know him as a person who has heralded many innovations and changed perception of Rashtrapati Bhavan. People are people and among all, Indians are the most argumentative. If above change is mooted, some may start quarrelling over usage of ‘Raashtra-Pitaa’ title of Mahatma Gandhi. They should not. Even if ideally no one can claim to be ‘Pitaa’ (Father) of India as it has been a well-known entity from the time immemorial, the case of today’s India as geographically defined current territory is different. There is no harm in accepting Mahatma Gandhi as Father of Nation, he being one of the main leaders, a father figure (people spontaneously addressed him as ‘Baapu’-Father) and internationally acclaimed person who shaped what is currently known in world as “India”. The word, ‘father’ is applied not to only a biological father, but also to creator of things too. To the best of my knowledge, there is no title or position as ‘Raashtra-Pitaa’ (Father of Nation), specified in the Indian constitution. Therefore, at best it is only an informal term, lovingly bestowed by her people. 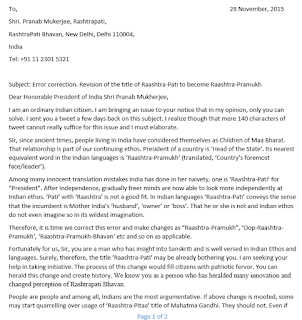 Chances that above feared feud may take place among argumentative Indians can be eliminated to a great extent and transition can be made from ‘Pati’ to ‘Pramukh’, if incumbent President himself takes lead and requests for change in his Indian language title. His English language title ‘President’ needs no change. ‘Pati’ of Indian ‘Raashtra’ is an outrageous idea.